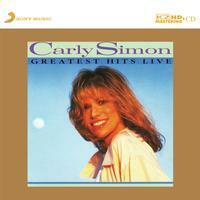 Greatest Hits Live is singer-songwriter Carly Simon's 15th album, second greatest-hits album, and first live album, released in 1988. It is Simon's only live album to date. The album includes some of her biggest hits. All the songs are live versions recorded on 35mm film from a 1987 HBO special shot on Martha's Vineyard called "Carly Simon: Live from Martha's Vineyard." The album sold very well opon release, going Gold immediately. In 1996, the album was certified Platinum by the RIAA, for sales of over 1,000,000 copies in the United States alone.